Who would dream the WIT Ministry would stir the hearts of so many women...even those in high school! As one of our youngest member of a WIT Ministry, Paige Shope, a senior in Gainesville, Georgia, has a compassionate heart for women in need. She plans to attend college next year, working toward earning a degree in professional counseling and social work. With a strong desire to help improve people's lives, Paige attends the Blackshear WIT Sunday Bible Fellowship Class. 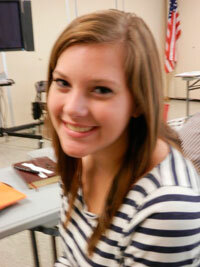 Recently, she has volunteered to be the first Editor of the WIT Newsletter at Blackshear Place Baptist Church. Following the tried and true format suggested on the WIT Web Site, Page's first WIT Newsletter was printed on October 24th and has reached many ladies, including the women inmates at the Hall County Jail. May God bless Paige as she pursues her goals in life following and serving the Lord Jesus Christ.